Our quote turnaround is super quick, making it easy to budget and then proceed with your one off event or multiple bookings. We will open any day of the week for your event including weekends and evenings, pending availability! An All Day Session avoids you having to pack down at days end, the room is yours to store all your equipment and retain set up overnight. Access to the rooms is 30 minutes prior to your booked session for set up and AV testing. As we run to a very tight schedule, we do ask that you vacate your room as close to your finishing time as possible so we can reset and refresh the room ready for the next event. For availability and pricing, event enquiries can be made to the Function Centre team on Tel: 9451 0888 or by email at admin@techparkwa.com.au. 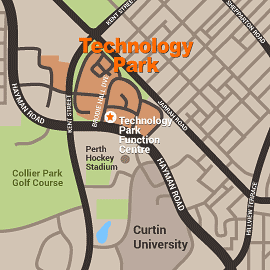 National Australia Bank (“NAB”) handles all aspects of credit card processing for the Technology Park Function Centre. No credit card information is stored by the Function Centre or by its manager, Burgess Rawson. No-one wants or likes to cancel bookings but we understand in the course of business this happens. As we have turned away other potential training sessions or seminars because of our promise of the space to yourself, we ask that you advise us as early as possible your intention to cancel. That way we have the best chance to re-sell the event space. By making a booking, you accept our cancellation policy and its related fees. No event, group or company is exempt from paying cancellation fees. Should circumstances arise where you have to cancel your booking, this must be received in writing and the following cancellation fees will apply. if a booking is cancelled 31 days or more from the Event then an Administration Fee of $150 may be charged. changes of dates and postponements for your Event are treated as a cancellation.